MEDFORD TWP., N.J. (WPVI) -- Police in Medford Township, Burlington County are searching for a road rage suspect and his vehicle. The Medford Township Police Department released a composite sketch of the suspect on Tuesday, as well as a surveillance image of the suspect vehicle. Police say the road rage incident began in Mt. Laurel Township on Friday, February 16. At approximately 9:02 a.m., a driver struck a tree on Ark Road in Medford and was ejected from the vehicle. The driver was airlifted to Cooper Trauma Center for treatment. Police say during the incident, the suspect left his own vehicle and displayed a black baseball bat. 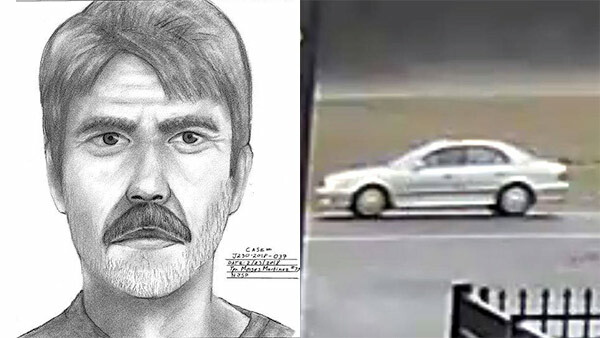 The suspect is described as a white male, 50 to 60 years of age, 5'9, 150 to 160 pounds, with a thin build, gray moustache, and salt and pepper hair. Police say the vehicle, a silver/gray 4-door sedan, has a distinctive softball sized dent over the passenger side rear tire. Anyone with information should contact police at 609-267-8300, or the anonymous citizen tip line at 609-714-0302.